Winter is coming… well actually for many of us, it’s already here! If you’ve traveled by air in wintry weather, you’ve probably glanced out your window before takeoff only to see strange-looking vehicles circling the plane spraying a gooey substance over the fuselage, tail and wings. This de-icing process – removing and preventing ice and snow buildup on an airplane – is critical to ensure a safe takeoff. At Delta, the de-icing teams trained to tackle winter storms begin their preparation long before the first snowflake falls. Delta’s Minneapolis-St. Paul hub is one of the largest de-icing operations in the airline’s U.S. network, with a fleet of 28 vehicles and over 200 ramp agents. Each summer, it hosts an intensive training certification program to teach agents from across the airline how to properly apply de-icing and anti-icing fluids. To qualify, each participant must master an online assessment and the remainder of the course involves both classroom and hands-on training. But the training doesn’t stop there. Ramp agents, like those from Delta’s Salt Lake City operation, continue to hone their skills through video review and aircraft simulation. When temperatures dip below 50 degrees (at MSP that’s usually in early October), daily morning inspections begin on each aircraft. Anytime a so-called “contaminant” such as frost is spotted on surfaces that would inhibit the ability to create lift, the aircraft must undergo the de-icing process. There are several different types of fluids available to protect an aircraft from the elements, but Delta uses Type I de-ice fluid (orange-colored) and Type IV anti-ice fluid (green-colored). Type I de-icing fluid is a mixture of a chemical called propylene glycol, combined with other chemicals, inhibitors and water. It’s heated to between 160 and 180 degrees Fahrenheit and sprayed under pressure to remove frost, ice and snow on the aircraft. “We’re the top user of glycol in the country for Delta, and that’s not necessarily something to be proud of,” joked David Pederson, Delta Operations Service Manager – Minneapolis-St. Paul International Airport. 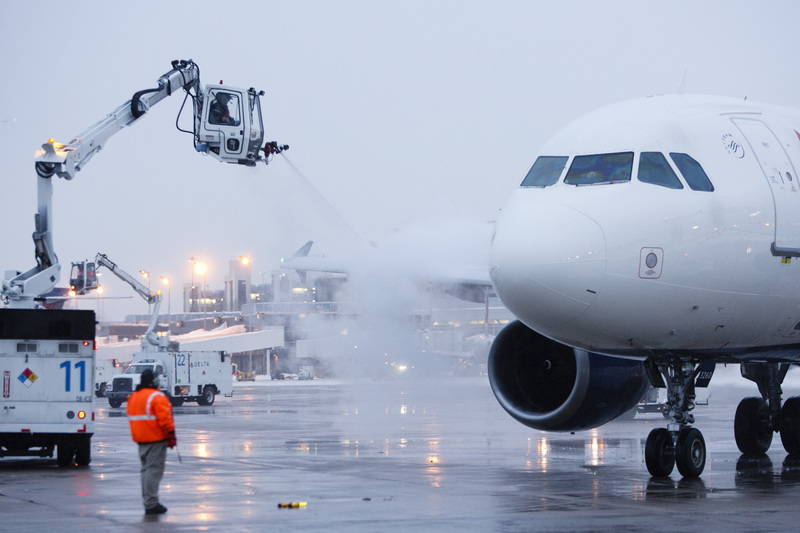 This upcoming winter season, five airports or stations Delta serves will be testing out a new, more environmentally friendly de-icing fluid. If winter precipitation is falling, such as snow, freezing rain or sleet, an additional step needs to be taken to prevent ice from reforming on the aircraft before takeoff. For these cases, Type IV anti-icing fluid is applied on critical surfaces like the wings and tail after the de-icing process is complete. Aircraft are usually de-iced on a remote pad near the runway before takeoff, but they can also be de-iced directly at the gate. This not only saves time but fuel. Investments in state-of-the-art technology are also helping Delta improve the efficiency and effectiveness of the process. This year, Delta’s Salt Lake City operation added two new de-icing pads and five new de-icing trucks. Depending on the size of the aircraft, up to four vehicles may be used in the process. 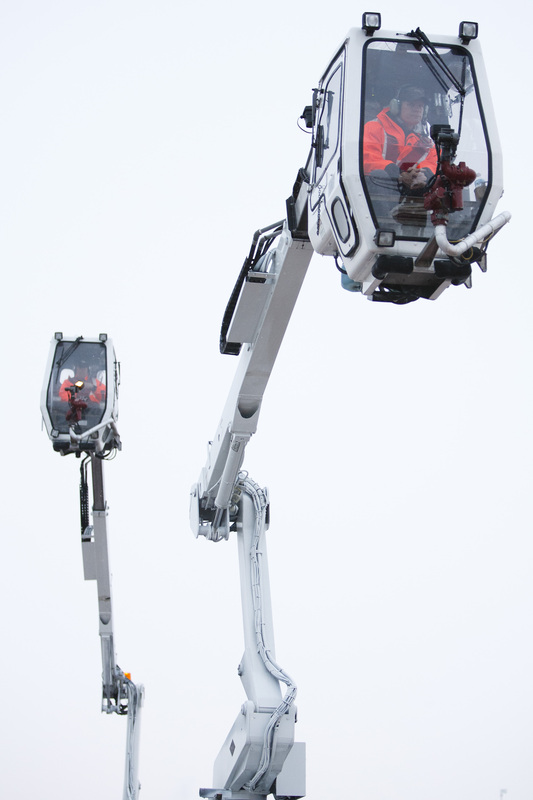 Each vehicle has one driver and one de-icer who applies the de-icing and anti-icing fluid as needed. When spraying on the pad, an additional crew member may be assigned to communicate with the flight deck and complete the final inspection before authorizing the aircraft for takeoff. During the de-icing/anti-icing process, pilots configure the aircraft by putting down the flaps and temporarily disabling the aircraft’s ventilation system to prevent the sweet scent of glycol from entering the passenger cabin. From nose to tail, a de-ice spray can take as little as five to ten minutes to complete depending on the size of the aircraft. An anti-ice spray takes another five to ten minutes, so barring a major weather event, crews can apply this extra layer of protection to roughly six planes per hour. After the job is complete, all the excess fluid is collected and recycled. Last year, MSP used nearly 900,000 gallons of de-icing and anti-icing fluid combined, with a total cost of approximately $5.5 million. The hub spent nearly double that amount in 2013 due to a harsh winter that extended through May. 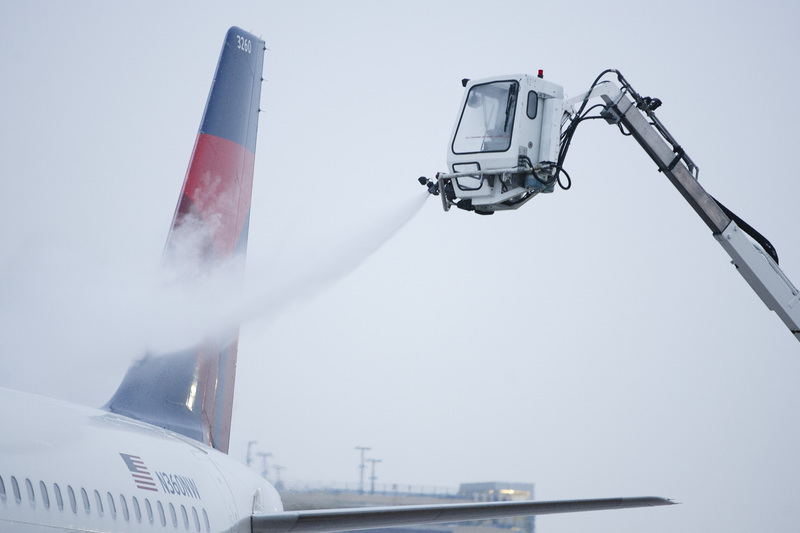 Overall, Delta has 235 airport stations equipped to de-ice, and 195 of those are in the U.S. Yet, in the event of a monster, record-breaking storm like the one in Boston last year, those stations may need some extra help. To that end, Delta created “Go Teams” of de-icing volunteers from Detroit, Minneapolis-St. Paul, Salt Lake City, and Cincinnati who are prepped and ready to respond at a moment’s notice. So this winter when you’re traveling on Delta, remember there are dedicated de-icers just outside your window who are working hard to keep you safe and get you to your final destination on time. Oh, and they really don’t mind the friendly waves and puzzled expressions on the faces of some of the passengers.